PURE HOSPITALITY S COM USD0.001 (OTCMKTS:PNOW) has been making a lot of progress forward in cleaning up the company and putting it on a growth track. It is not hard to see why investors are starting to gain interest in the company and shares. PNOW has been on a path to reducing toxic debt, up-listing to a senior exchange, growing the company, and become a revenue generating company. In recent developments, PURE HOSPITALITY S COM USD0.001 (OTCMKTS:PNOW) has been on a path to cleaning up its balance sheet and reducing toxic debt. It announced that the company has positioned itself to eliminate $3,000,000 of its current obligations. In addition, it has begun purchasing notes from major debt holders to retire its toxic debt as to remove downward pressure on the share price and remove dilution. Management has negotiated with a private investor for a sizable capital investment into the Company, which is a long-term investment, and is not due until 2017. Removing this toxic debt is critical for preparing PNOW for the next stage of growth and evolution. Oveedia is owned by PNOW and is its flagship product that is continuing to grow rapidly. It is a Central American-Caribbean online travel Agency. The CEO is ensuring complete transparency and setting the company up for future growth. 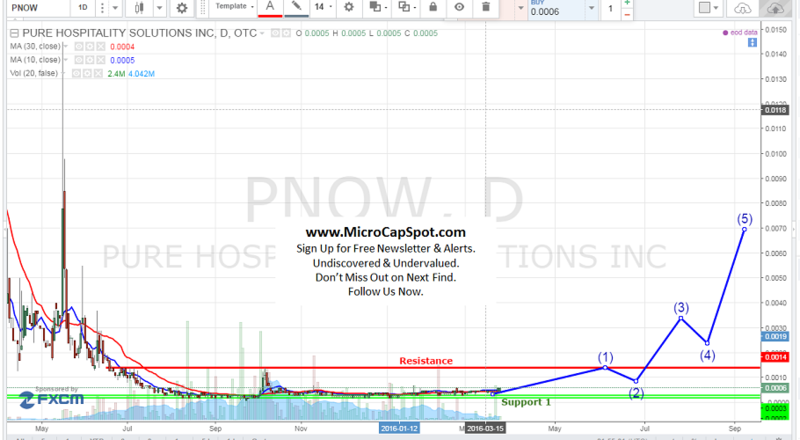 PNOW is planning on becoming a fully reporting company with the SEC, raise non-toxic financing to fund expansion and growth of Oveedia, and up-listing. It is aiming to up-list to the NASDAQ in 2017. The company has extensive plans over the next 12 months from attending conference to marketing campaigns to increase bookings and positioning of Oveedia as the travel and tourism hub for all of Central America and the Latin speaking countries of the Caribbean. PNOW has received an exclusive invitation to work with a small focus group, designated by The Secretary of Central American Tourism Integration (SITCA) and Costa Rica’s Tourism Chamber, CANATUR. SITCA has taken the initiative in building the framework and strategy to expand Central America’s tourism capabilities. With the Latin American [LATAM] travel market surpassing $80 Billion this year, management believes that this is the prime time to position Oveedia as the travel hub for all of Central America and the Latin speaking countries of the Caribbean. Oveedia is an online travel agency (OTA) which is primarily focused on tourism to Central America and the Latin countries of the Caribbean, positioning PNOW as a viable acquisition candidate for one of the larger online travel agencies, because the $34 Billion Latin American online travel market is currently underserved by OTAs. PNOW provides proprietary technology, marketing solutions and branding services to hotel operators and condominium owners. The Company’s vision is to build competitive operations in the areas of (i) online marketing and hotel internet booking engine services, (ii) hotel branding and, (iii) own, operate and in some instances develop, boutique hotels under the new, “by PURE” brand. PURE is the creator of Oveedia (www.Oveedia.com), the Central American-Caribbean online travel hub. PNOW is currently trading at a 0.01 million market valuation. The company is making great strides in terms of transparency by clearly articulating its plan and strategy. PNOW has all the right makings of a powerful stock ready to explode 1000%+ overtime as it executes its strategy of growing Oveedia, eliminating toxic debt, become fully reporting, and up-listing to a more senior exchange. We will be updating on PNOW when more details emerge so make sure you are subscribed to Microcapspot so you know what’s going on with PNOW. Disclosure: we hold no position in PNOW either long or short at the publication of this article and we have not been compensated for this article.